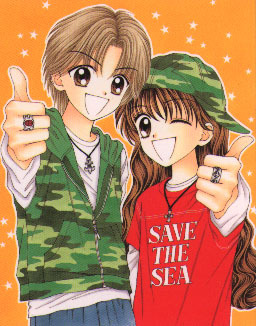 Mint na Bokura (Minto na Bokura) manga series by Yoshizumi Wataru images, info, and character profiles. Part of a diverse shoujo anime, manga, video gaming, and live-action Japanese drama website. 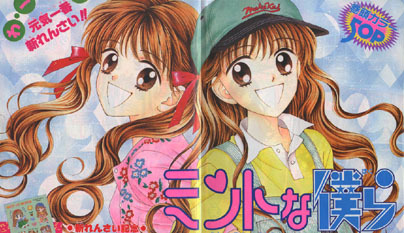 "Mint na Bokura" is a hilarious school love comedy by Yoshizumi Wataru (Marmalade Boy, Handsome na Kanojo), which ran in the manga magazine Ribon. 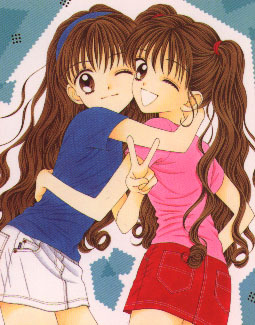 When 14-year-old Minamino Noeru returned home from a Hawaii trip with his dad, he was faced with some shocking news: his twin sister Maria had gone off to boarding school to be with a basketball team captain with whom she'd fallen in love! Noeru quickly decided - he couldn't live without Maria, his own dear Maria whom he'd grown up with and who was so important to him. Lately he had sensed they were drifting apart. Noeru would not take this sitting down; he wasn't going to lose her! The only thing to do was to go to the school, sabotage Maria's chances with the guy, and bring her home. Noeru asked if he could go to the boarding school too, and was really excited when he received permission. There was a catch, though.... Noeru would have to go as a girl because there were no spaces left in the boy's dorm! Noeru packs up and arrives at the school, much to Maria's surprise. She can't believe her brother is introducing himself to the class as her twin sister?! Noeru looks the part easily. Outfitted with a wig, Maria's clothes, and spandex shorts under his skirt, nobody can guess he isn't really a girl. Noeru's dorm roommate is a girl named Miyuu. They meet when she climbs in the window after curfew. Noeru hears rumors that there's something strange about her. Sasa, a classmate, soon makes friends with Noeru through their love of fishing. Sasa has never been interested in girls before, and the school is buzzing with the news that he and Noeru are spending so much time together. Noeru ignores the gossip, but Sasa is really liking his new companion.... Noeru is caught completely unaware when Sasa kisses him! Noeru has to tell Sasa that he doesn't love him, and Sasa begins to avoid him. Noeru misses their treasured friendship, so he decides to let Sasa in on his little gender secret. Meanwhile, Maria realizes that her crush doesn't love her. He already has a girlfriend. But then she meets his younger brother. What a cute guy! Noeru begins to realize he has a big problem. He is in love with vulnerable but spirited Miyuu! How can he date her when pretending to be a girl, and her trusted roommate and confidante at that? He "creates" a male cousin to meet Miyuu. 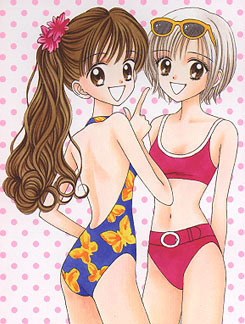 With Noeru playing the cousin and Maria playing female Noeru, it should all work out, right? This is only the beginning of a very funny and cute romance story. It continues to add more characters and humorous situations as it progresses. Maria's old boyfriend shows up, Noeru gets a love letter, and Sasa has a secret regarding Miyuu. Noeru and Maria's life just never gets easier, but it's a lot of fun!